Are you looking for expert Marietta electricians for your home or business? Bryan Electric’s staff of trained technicians is available to Marietta residents in need of electrical services. We use advanced tools and equipment to assess your system and put together the ideal plan to meet your needs. Even better, we customize the solutions to your situation, and we always put your satisfaction first. You can also trust when you work with Bryan Electric you will have the tips and guidelines to help you maintain your system and extend its lifespan. Whether your needs are commercial or residential, our team of Marietta electricians at Bryan Electric can get the job done to suit your preferences. We’ll use thermal imaging technology to help your system reach its full potential, and we also offer regular inspections that can help you avoid future expenses due to repairs. By finding and fixing the small issues before they can develop into bigger problems, our team saves you money and a whole lot of hassle. Speaking of saving money, we even help our customers save on their utility bills with our audits, which identify ways of cutting back on energy consumption. At Bryan Electric, we understand how important it is for you to get your power working as soon as possible after an issue arises. That’s why we offer 24/7 emergency electrical service, with quick response times and fair prices. Your satisfaction is our top priority, and we will even make sure you know what our rates are before work begins. 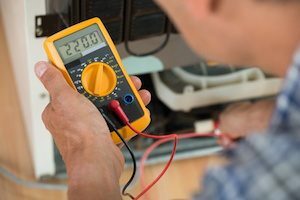 Our trained technicians come equipped with valuable experience as well as the technology needed to resolve whatever electrical problems you might be experiencing. Our experts will perform a thorough analysis of your system in order to figure out the best ways to improve it. Our preventative maintenance plans will help your system’s efficiency stay at peak levels. They’ll also lower your future repair costs by allowing us to catch problems early. Issues handled quickly tend to be cheaper fixes, and we will always do whatever we can to help you save money while providing the quality work you deserve. Ready to get in touch with our expert Marietta electricians? Discover how easy and straightforward getting the right electrical services and repairs can be by contacting Bryan Electric today; visit us online or call (770) 680-2144.